This recipe makes about 32 small toaster-sized breakfast pitas. The dough is like butter. Well, it's made with butter, maybe that's why. Soft and pliable and dreamy to work with. My only reservation is that it requires a lot more yeast than conventional bread. [Note: since originally posting this recipe, I've experimented with less yeast, and have adjusted the yeast measurement accordingly]. Combine in a mixing bowl: 6 cups bread flour (whole wheat or some combo of white/whole wheat works well), 4-5 tablespoons honey, 3 teaspoons salt, and 6 teaspoons yeast. Add 4 tablespoons melted butter and 2 1/2 cups room-temp water. Stir well until blended. Knead for 5-10 minutes or until the dough is smooth and elastic (add flour or water as needed to reach desired consistency). The dough should be moist-ish, but not sticky. Let rise, covered, in an oiled bowl, for an hour or two. Punch down the dough, divide in half, then divide each half into 8 pieces. Cover and let rest for 20 minutes. 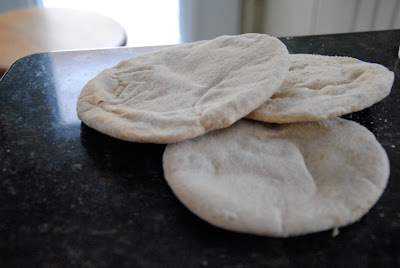 Then, flour a clean surface, divide each dough lump in two, and, using a rolling pin, roll each small lump into a flat circular shape, about 1/8-inch thick, or thicker, if you like a thicker pita. (It's a lot of dividing, so note that each half makes approximately 16 small pitas). If you have a baking stone, use it. If not, flip over a cookie sheet (or two), sprinkle with water, then place as many pitas as you can on the back of the cookie sheet--I fit six on each tray. Bake until the dough puffs up, about 4 minutes. Remove and cool on rack. Apparently, if you leave the pitas in the oven too long, they won't unpuff. Note: If you want to replicate the store-bought breakfast pitas, try adding, in small amounts, dried fruit, seeds, and/or spices at the combining or kneading stage of the recipe. My kids can't agree on which fruits/seeds/spices would be acceptable, so I'm sticking with the plain recipe for now. Plain also works well as a flat hamburger or sandwich bun. Keep the pitas fresh by freezing them. They thaw out quickly in the toaster. Slather on honey and peanut butter, and in our house, at least, the day has a happy beginning.